This is my firs time trying false nails. I was so excited to try them. The design of the nails are a bit too much.. poka dots on all nails? but they grew on me and I started to really like the design. I am glad that the base is pink because I love pink nails. 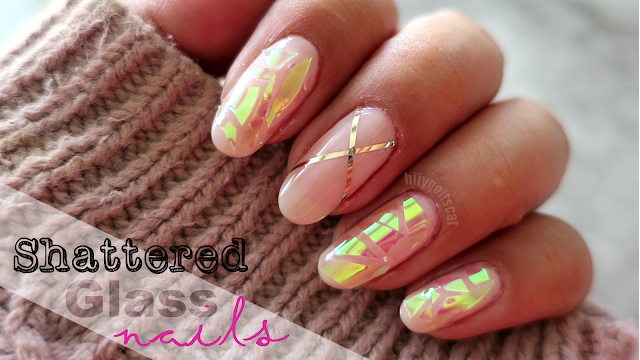 Wanna see my thoughts on these Kimme Kyee Star inspired false nails? "Elegant Touch Kimmie Kyees Celebrity Nails Glitter 24 Nail Creations with Adhesive Tabs. Inspired by the styles Kimmie creates for her long list of celeb clients; you can get a taste of the celebrity glamour by wearing her incredible designs. Glue-tabs are a fantastic way to secure the nails for instant results that last up to 7 days. No glue is required, they simply press on to your nail - easy!" The packing comes with 24 nail tips and adhesive tabs. 1 of each size show cased.. and then extras are on the side. You basically find the tip and adhesive that fits your nail bud and put them on the side so they don't get mixed up. I've always wanted to have round nail tips.. which I've done once but went back to squared nails. You are suppose to put the round of square side.. which ever side fits your nail bud better.. in my case the round tips fit my bud.. but I wanted to try it the other way around anyway. You can see in some of the photos why they have you put the side that fits your nails.. some of my nails peek through the sides.. because my nails are square. Here are my nails with the square side up. You can see that it fits my fingers and nails a lot better than the previous way because the previous way was wrong.. Like I said I wanted to experiment. You can find these at Ulta with various other designs for $8.49. They are currently 8/19/12 buy 1 get 1 free at Ulta! 3 out of 5 stars. I like the designs.. and the thoughts behind it but you can see from the previous photos that they stick out a lot. I think if the adhesive was thinner it would work out a lot better. This was my first time trying false nails.. so I'm not sure if I applied them correctly. I don't know if I was suppose to pull the adhesive to thin it out and fit my whole nail or do it the way I did. Either way.. I will give these another try once I look up more ways to apply them since I have extras and the ones that I did use did not mess up. I'll be trying them with the adhesive again as well as regular nail glue. I think I would rather prefer the nail stickers like kiss dress instead of buying false nails.. if I wanted a quick nail design. Elegant Touch also has the nail stickers.. I wish I would have gotten those =).. but I thought it would be fun to try false nails for once since I have been curious about them. It was fun and I learned a lot through this process. I would rate this product a 3/5 because the design is nice and the application is easy.. the lasting power was not bad either.. It probably would have lasted longer if the nails sticked all the way down without any gaps. I hope you guys enjoyed my first impression of false nails.. what do you think? Did I apply them right? how can I fix the gaping problem? Aren't they? You get use to them haha the color combo is pretty!